Why no, we had not, but it sounded like a wonderful idea. I emailed a few local coffee roasting companies, and received three invitations to stop by and pick up some coffee sacks. Two of the three said to stop by anytime; the third (a much larger operation that shall remain nameless) asked me to let them know when I was coming. Due to some weekend and evening work hours, I had last Tuesday off. I started the day by running a bike errand in the vicinity of the coffee roasters. I had not heard back from the third roaster with a specific time, but since I was right there, I decided to stop by anyway. BAD IDEA. I politely informed the woman at the desk that I had exchanged emails with Nancy* about coffee sacks. Front desk woman called Nancy, and they proceeded to have a conversation centering around the fact that Nancy had NOT replied to my email confirming a day and time, and that I last emailed them on a Sunday, when they were closed, and then Monday they were swamped, but okay fine, I could go around to the loading bay and they would give me some sacks. And I stood there as front desk woman relayed this to me, thinking, “If this is really a big inconvenience, you could just politely ask me to come back later.” But no, she said I could go back to the loading bay. Back at the loading bay, bicycle in tow, I informed a worker that I was there for some coffee sacks. He asked how many I wanted, and I explained that I was on my bicycle, so I could take a small load and come back with a car if they had more. And hoo boy, did they ever have more! He walked over to a HUGE box and pulled out an armful. That armful filled my crate to overflowing. I said I would be back with a car, and he said to come before 3pm. I pedaled off, really wishing I had more hauling capacity on my bike. Little did I know that in a few hours, I would really, really, really wish I had that hauling capacity; the whole thing would have been over and done with right then, no saga involved. Five hours later . . . I pulled up and parked on the street by the loading dock. As I was about to walk into the [enclosed] loading dock, an 18-wheeler started backing into the only open loading bay, cutting off my route to the sacks. The driver proceeded to maneuver that truck, in again, adjust, out again, for TWENTY-FIVE minutes, while I stood there with growing distress. Finally, an employee came out to help the driver navigate, and at long last, he got it right. I approached the employee (the same man I spoke with in the morning) and asked about the sacks. He responded that they had to get the truck unloaded first. In my distressed and heat-addled state (did I mention that it was hot? Because it was really ridiculously hot. ), I didn’t think to ask HOW LONG it would take to unload the truck. Nope, instead, I proceeded to stand there for another FORTY minutes, listening to unloading sounds coming from the trailer. Finally, with tears of frustration and exhaustion about to escape, on the brink of having some kind of break down, I decided to leave. Why had I just sat there for over an hour, an hour of my life I would never get back, when there was ANOTHER coffee roaster a few blocks away? Fifteen minutes later, after a much more pleasant interaction, I left coffee roaster #2 with a small stack of coffee sacks. However, the HUGE box of coffee sacks at roaster #1 plagued my memory. Our garden is rather large, and I was pretty sure we could use many more sacks. Maybe that truck at roaster #1 was gone — what harm would it do to go back and check? I pulled back up to coffee roaster #1 just as the 18-wheeler pulled out of the loading bay. I walked into the bay (in retrospect, I should have pulled my car into the bay), only to see another truck starting to back into that very bay. I waved my arms to get the driver’s attention. When he paused, I made the fatal error of moving instead of holding my ground. Once again, I watched my shot at the coffee sacks evaporate again. But enough was enough. I watched the driver exit his truck, slide by the side of another parked truck, climb a short ladder, and enter the holding area. I followed close on his heels. I approached a worker in the loading area. When I pointed out that it was almost 3pm, he asked if I could come back tomorrow morning — mornings were less busy. Could I come back tomorrow? I’ve been waiting here for OVER AN HOUR, I made a special fossil-fueled trip just to pick up these sacks, one of your coworkers told me that I could get them if I came back before 3pm today, and you want me to come back tomorrow? I didn’t say all of that; I don’t know if I really said anything at all, but I guess my body language said enough, maybe he’d had bad experiences with a red-head’s temper, but whatever the case, he hopped to it. Next thing I know, he had another worker getting a lift to transport the box of coffee sacks to some alternate loading area at the front of the building. He directed me there, and in a matter of minutes, we stuffed the trunk and back seat ull of sacks (the trunk almost didn’t close; we could have fit more in the back seat, but it seemed like so many at the time that I declined more). I drove home and collapsed in exhaustion. The coffee sacks are now doing their thing in the garden. My car load met our needs for now, but we will want more. No, I’m not looking forward to a repeat trip, thanks for asking. 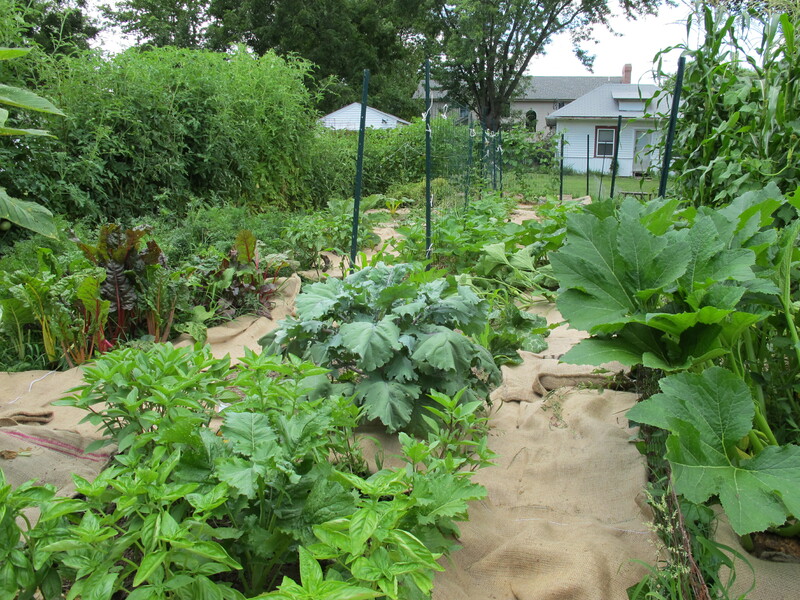 This entry was posted in Biking, Garden, Green Ideas, My Life and tagged gardening, reuse. Bookmark the permalink. Holy Moly! That sounds like quite the arduous adventure! Hope they work out. I’ve used landscaping fabric on the paths in my garden, but after a few years there’s so much dirt on top of it that the weeds just sprout on top and send their roots down into it. Do you plan to leave them down or take them up at the end of the season? I’m not sure whether we’ll leave them down or pick them up. They’ll last longer if we pick them up in the fall, but we want to start making dedicated paths in the garden so we don’t walk all over the places we’ll be planting next season. Leaving the bags down on the paths would help with that aspect.